This new Xbox Wireless Controller that ships with Xbox One S features some exhilarating refinements to take your game control to the next level. 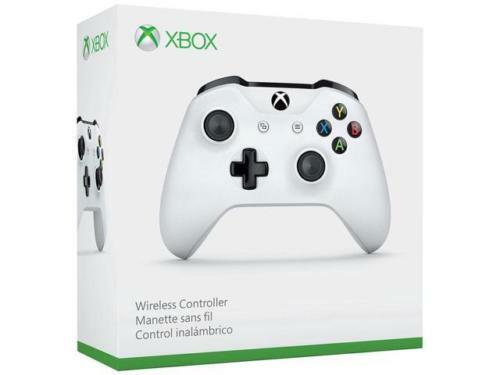 Compared to its predecessor, it comes with a sleek, streamlined design and textured grip for better control and comfort, better wireless range when pairing with Xbox One S, new thumbstick design that reduces wear, and Bluetooth connectivity for use with compatible PC without the wireless dongle. You'll also feel at home with existing designs acclaimed by the worldwide gamers. Impulse Triggers deliver fingertip vibration feedback, so you feel every jolt and crash in high definition. Its transforming D-pad delivers the ultimate in precision, accuracy, and control. Plus, you can plug in any compatible headset into the standard 3.5mm stereo headset jack. To enable easier wireless connection to your Windows 10 devices, Bluetooth support is added thus you can use this controller with compatible PCs and tablets. This newly designed Xbox Wireless Controller feature textured grip for enhanced comfort. The new thumbstick design significantly reduces wear to help maintain accuracy and smooth rotation over the life of the controller, so you never miss a beat. The Xbox Wireless signal performance is improved, giving you a more reliable wireless connection to the console and up to twice the wireless range when used with Xbox One S.
Responsive thumbsticks and an enhanced D-pad provide greater precision. Feel the action with Impulse Triggers. Impulse Triggers deliver fingertip vibration feedback so you can feel every jolt and crash in high definition. Triggers and bumpers are designed for quick access. Menu and View buttons quick for easy navigation. Connect up to 8 Wireless Controllers at once to your console. Seamless profile and controller pairing. Compatible with Xbox One Play and Charge Kit, Xbox One Chat Headset, and Xbox One Stereo Headset. Remap buttons through the Xbox Accessories App (With Xbox Accessories app, on Xbox One consoles only).